Mix ¾ of the zest of the lime with the sugar and salt. Place the salmon in a bowl and pour the tequila over it. Turn the salmon over in the tequila a few times, allowing it to penetrate. Cover with the sugar-salt mixture and refrigerate for a few hours. Then wash the salmon and drain well. Cut the cucumber and gherkins into small cubes. Crush the candied nuts. Thinly slice the strawberries. 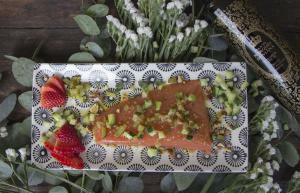 Serve the salmon with the cucumber, gherkins, strawberries and crushed nuts on top. Drizzle with our Palacio Marqués de Viana Sublime Blend extra-virgin olive oil. This is sure to become one of your essential recipes!